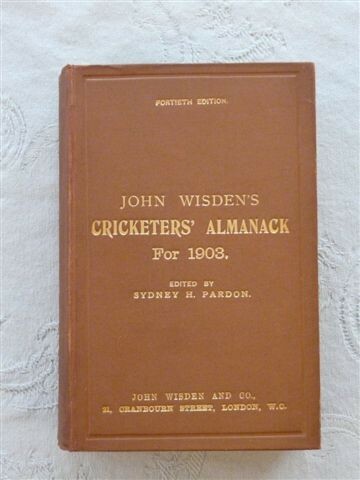 THIS IS AN EXCELLENT 1903 WISDEN HARDBACK. THE FRONT AND REAR BOARDS ARE IN EXCELLENT UNMARKED CONDITION AND THE GILT IS BRIGHT TO THE FRONT COVER. THE SPINE IS IN FINE CONDITION-NO CREASES OR MARKS AND ONCE AGAIN THE GILT IS BRIGHT. THE FRONT AND REAR PASTEDOWNS ARE POSSIBLY THE BEST I'VE SEEN ON A 1903 HARDBACK,ALTHOUGH AS USUAL THE MARGINS HAVE DARKENED A LITTLE. I'M NOT SURE WHETHER THE HINGES HAVE BEEN REPAIRED.BOTH HINGES ARE QUITE SECURE BUT THE HINGES ON THE 1903 HARDBACK ARE NOTORIOUSLY WEAK SO SOME REPAIR MIGHT HAVE BEEN CARRIED OUT AT SOME POINT-ALTHOUGH IF IT HAS IT HAS BEEN VERY WELL DONE. THE CONTENTS AND PHOTOPLATE ARE IN NEAR FINE CONDITION-CLEAN AND UNMARKED. AT THE TIME OF LISTING WE COULD SEE ONLY ONE OTHER COPY FOR SURE ON THE NET-PROBABLY IN LESSER CONDITION TO THE ONE LISTED HERE AND AT A PRICE OF £2640. POSTAGE IS BY SPECIAL DELIVERY AND INCLUDES FULL INSURANCE.